I was going to say number 3 was my favorite. Then I saw the last one. Yikes!! WV: flastedc. "I'd be gabberflasttedc, but this IS cake wrecks!" #1 has a really great singing voice - oh yeah, you too John! It reminded me a lot of the "Once More With Feeling" episode of Buffy the Vampire Slayer! 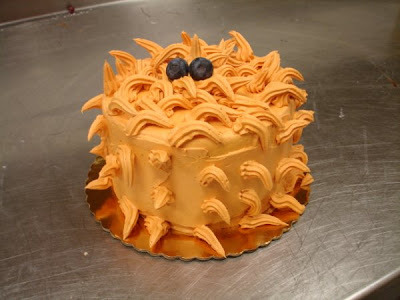 I think the orange thing is supposed to be The Flying Spaghetti Monster with blueberry eyes? Great post, made greater by the video. I'm so in awe at how the 2nd phone call came right at the end. LOL! That was a hoot. John - you outta be in the biz! You were awesome! Great, now I'll have that song stuck in my head too. Okay.. the last one looks like poo. Eww! 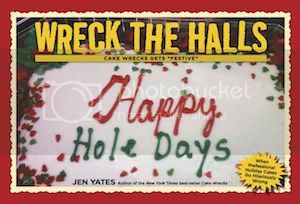 Cake Wrecks: the musical - coming to an off-off-off-off-off-Broadway hovel, I mean theatre near you! So THAT'S what unicorn poop looks like! John and #1 singing the page was the BEST part. Y'all should start a cake wrecks show. Or Youtube channel. The first one looks like a rainbow poop! "taste the rainbow!" These cake wrecks are amazing. But I think I laughed more at the video- the phone calls?! Hilarious! You guys crack me up!! LOVE the video at the end. You should record yourselves more often!! The first one: Either someone didn't clean up after Rainbow Brite's flying horse, or it's supposed to be Dr. Seuess's "Oh, The Places You Will Go". okay...love the pics but the video at the end was GENIUS! OMG, the song...the singing...the GLEE-like duh-ba-duh-bah-duhs!!!!!! Oh my gosh, the video is hilarious! I love it...especially the phone call and then the explanation of the dog - silliness, I tell ya! Nicely done. I love that song!! Your version is way better though! That was hysterical!!! The first one looks like a unicorn pood on the cake. They used a VOTIVE candle in #7. Wonder if it's scented? That would make a total multi-sensory wreck experience. In my head, the conversation that they were having on the phone went an entirely different direction. On the plus side, you did an AWESOME job with one of my favorite movies' songs!! BTW, I think the top cake is supposed to be for Seuss' "Oh the Places You'll Go!" Look up the book cover. I did a similar theme, though I like to think mine was a better attempt, but would probably still be considered a wreck (though it was not a paid for cake). #4: Carrie must be the name of their septic tank. Its so nice they remembered their tanls birthday! Septic tanks don't ususally get the recognition they deserve. Bravo! Nightmare before Christmas is one of our family's favourite movies... my 3 year old came over right away to listen... and see why I was laughing so hard! Pure Brilliance! Hahaha! This is fantastic! So glad you recorded the song--there's some real talent there--and the interruptions definitely added something. RIP the dog. The orange thing with eyes is the FSM--the deity of the newly created Flying Spaghetti Monster religion. I... I... 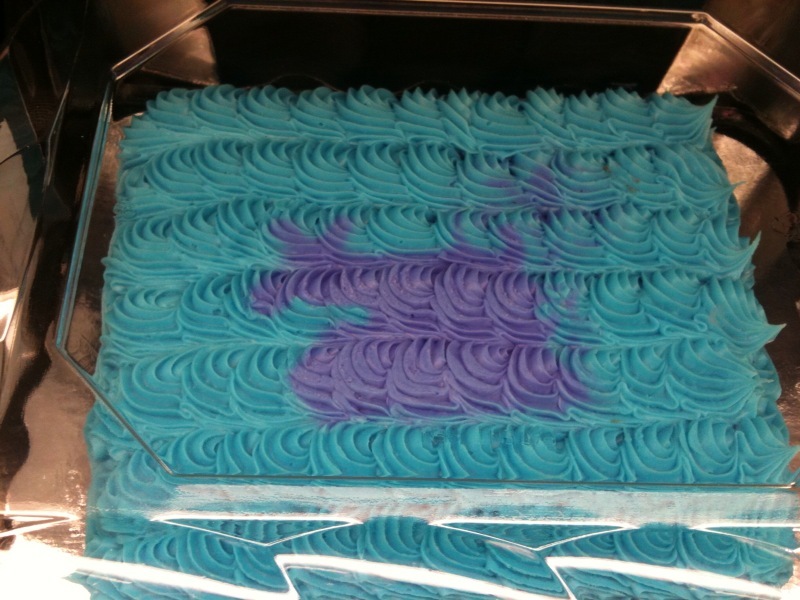 I think the Care Bears took a crap on that first cake... one at a time. wv: flachoo: the technical term for sneezing and farting at the same time. after a crappy tuesday I SO needed a better start to today. THANK YOU SO much!! this was perfect. The video was great. the phone call just built the humor to end with a dog dying....Carry on!! Thank you Thank you for bringing me out of my funk. "No way!Hahaha"... "Her dog died." Love, love, love it. Best. Post. EVER. I think the first one is supposed to be the thing from Dr. Suess...I think from "Oh The Places You'll Go". wow, that first one looks like a Care Bear took a dump on it. very nice! The song was fabulous, I agree that we may need you guys to record yourselves more often! Loved it! The first one is a gay pride poo cake. .....one of THE BEST posts yet. OMGoodness - video was hilarious! This is awesome! The whole thing. The song, the pictures, the reference to nightmare before Christmas, the video, the dog dying (no, I mean that was sad...)...the whole bloody thing was hilarious! Way to start my day! I do so love the video at the end. Not only do Jon and #1 have great fun voices which make me smile, but the phone interruptions are priceless. Without the pile of unicorn poo, the first cake is actually quite pretty. I was ROFL at the video! I wish more posts had audio accompaniment! That video is literally the funniest thing I have EVER seen - tears of laughter rolling down my face - brilliant!!!!!! Please oh please oh PLEASE do more videos!!!! Awesome! The interruptions actually make the video better. Only could happen here, I'm sure. I'm wondering if that last one's supposed to be from Avatar: Gold eyes, blue/green scaly bits, and the long connecting whatsit. I hope you do more Broadway-ish renditions of Cake Wrecks in future posts. That just made my morning! Oh dear god, I think THIS post is your funniest yet! I was making myself CHOKE from laughing so hard! Genius!!! 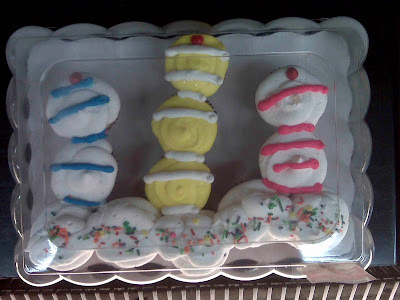 And on the flip side, those cakes: WTF????? I've got to put a link to this on my blog! I'd like to say the rainbow lump is a pile of Rainbow Dung. You know, from Neopets? So you're the ones everybody's talking about? Heh, heh, heh, heh. You're joking me, you've gotta be. These all are cakes, you do surmise? I must just split a seam now if I don't die laughing first. Your vocal stylings have wooed my hardened heart and melted my frosty exterior like that of an ice-cream cake in July. I am very close-mouthed and easily grossed when it comes to (digestive) bodily functions, etc. I just have to say that the first one resembles the type of "patty" that you'd come across as you strolled through a field of unicorns that lived in a Ski++les orchard and ate the fruit of the trees in light-spectrum order. Um. Best. Post. Ever. The video is the cherry on top...or was that two oddly placed berries? Either way - it rocked! I guess I have a warped sense of humor. Of course the dog died, doesn't everyone react that way? She was being funny! and it was! Stare at a rainbow, eat some Skittles, drop some acid...and THIS is the result! Wow, lots of CCC (patooie!) AND a gingerbread cookie with poo piled on him. How can you beat that? Am I the only person who tried to answer their iPhone during the video????? I LOVED the video! That tied it all together. I mean I was singing it in my head, but the video was the...er... icing on the cake? #4 is probably from Naruto. It looks sorta like the symbol for the hidden leaf village. This was BRILLIANT! Thank you so much! Her dog died? Is that because it had evacuated the entire contents of it's body onto that last cake? that was totally awesome. best post EVER. That was just fabulous... I think the other Jen's phone calls were my favorite parts, though. What exactly *is* the going rate for a pair of Gap cargo pants anyway? # 1 rainbow unicorn turd. #2 cupcake balancing act, #3 crab in the sun, #4 cinnamon roll or poo, #5 shark before it attacks, #6 quetzalcoatl, #7 looks naughty, #8 crying fire hydrant, #9 ginger poo. That song was made of magic and made my day. That was one of my favorite posts because of the song. Keep up the great work and I will keep sharing Cake Wrecks with family and friends! I love the fact that Jon was singing "Popular" when the tape started rolling. Wicked is the favorite around our house and there was a time when our 5 year old could sing the entire song. Your geekiness apparently knows no bounds. Awesome. My kids ran over to hear the song. Thank you. Now they want to know what "crappy" means. Harumph. this officially WINS THE WHOLE INTARWEBZ. I haven't laughed as hard as I was laughing during The Other Jen's and John's rendition. Especially when The Other Jen said, "No, I'm with Jen and John doing this thing; but it, it's dumb..."
The orange one is the Flying Spaghetti Monster. Bow when you speak his name. Or, Google him. 1. Rainbow Bright vs. a wicked bean burrito... guess who won. 2. 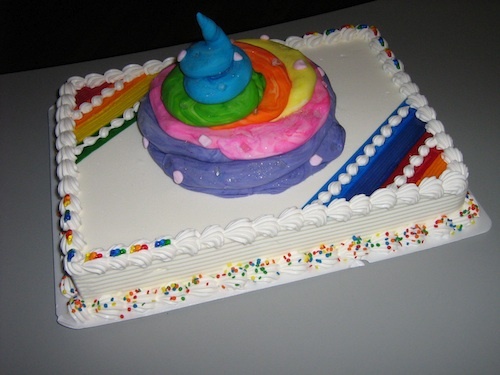 If a unicorn poos on a cake in the forest, does it make a sound? No, but they might take a picture of the cake. The video was a great touch, awesome voice #1. The phone ringing was right in time with the song both times. But about the dog... wow. Was Debbie Downer calling? I would like to thank you for getting that song stuck in my head. lol. I loved your rendition! Absolutely hilarious! I'd like to proudly display my music geek card as I declare I sang through that entire post. I LOVE that movie! Thank you for making my morning! I LOVE this post. LOVE... LOVE... LOVE. Freaking Hilarious!!! That is all. This has to become a weekly feature. What an awesome treat after enduring those hidious cake wrecks. Great job to John and #1 ~ but let's not forget the scrolling... great job!!!! Brilliant combination of song and cake. And really sorry her dog died! I am in love with that movie, that song and this post! Now I have the song stuck in my head! That video was AWESOME!! I was laughing so hard (not so good to do at work). I loved how they jumped back in after the phone call like nothing had interrupted them. "Ha! That's so crazy! No way! That's crazy! No, I'm just doing this thing, but it's dumb...That's so crazy! No, I'll call you back! ...Her dog died." AWESOME. Very SNL. Well done, you three. my daughter really thought these cakes were beautiful and she loves them and asked for most of them for her birthday. OMG, funniest thing ever! This was just what I needed on a boring humpday! The first one, while a bit odd, is actually sort of okay. Cheery and colorful, if a little barf-inducing (it's like a rainbow frosting Matterhorn! although probably meant to represent the cover of "Oh, the Places You'll Go!"). The rest...eeeee. Especially the blue blobby sprinkle eye thing (poor Sean). I'd scream "WHAT IS THIS??" when faced with those, too. Oh hey! I loved hearing the voices in your head. Now, go back and narrate the crab vs octopus one earlier this week. I bet your "voices" are even funnier than mine! WV: WORGINDS Some people like to listen to worginds with silent movies, but I prefer listening to John + #1. I LOVE YOU GUYS SO MUCH! That was the best video EVER! that is hilarious. especially when Jen stops abruptly and starts talking about her cargo pants :) so great. I don't think I've ever commented here even though I've been reading for years, and years, and years. But here I am sitting at work (I pay for my own Internet connection here) and I am just cracking up like mad. I was especially liking the post, then the video was better, but then the phone call in the middle, and then THE DOG DIED? Man, it's like living in some alternate, or parallel, universe? I am the consummate dog lover, yet I'm laughing so hard, my office mates thought I'd finally gone over the edge. Today's post was THE BEST EVER!! Loved the pictures and the video until I found out that I have no sense of humor when it comes to dogs dying. I gasped in horror. I'll work on it. Does anyone else want to hear "original" Jen sing? The first one is Unicorn Poop, an item from Deathspank. The video is hysterical. I love the call in the middle of that whole thing...and someone's poor dog died. After that...I'm not sure I'd let her invoice you for the pants. Ok, that was one of the best posts ever! I was laughing so hard at the phone call right in the middle of the video and how you guys just jumped right back into it. Now I have to wash the coffee spew off my screen. "Oh my god really" "Thats crazy"......"Her dog died". LMAO that made me almost spit out my iced tea! I sure hope the dog bit was not real because even though I though the pictures were unbelievable and the song priceless, the thought of anyones doggy dieing just makes me so sad. That video was just icing on the Cake Wrecks--pure awesomeness! I absolutely love the video! Might be my favorite post yet! The first one! Double rainbow across the cake! What does it mean? WHAT DOES IT MEAAAAAAAAAAN? I scrolled through all the comments and apparently I am the only one who cannot see the video. Sad face. Why does Firefox not like me today?? I hate being left out. Okay, I was totally singing it in my head and scrolling in time...so when I got to the video of that actually happening--Awesomeness! (Sorry to whoever's dog died, btw). Great job, singing, y'all! And THANK YOU for the ear worm from one of my all-time favorite movies!! You guys totally RAWK!! 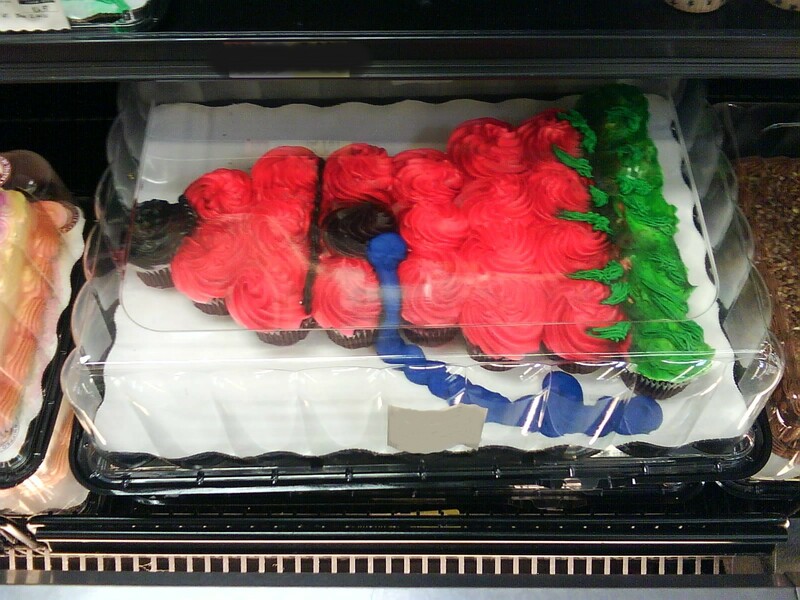 Cake Wrecks: The Musical! "Once More, With Sprinkles." Hahaha the video was awesome! More videos please! That song was AWESOME!!! Give us more, please give us more! wv: protones- that song has some serious "pro" tones in it! Poor Sean, not only does his cake look like snot with eyes, they jammed a candle holder in the middle of it. that video has made my hangover that much more bearable! so I was going to comment on how *now* the song is in my head and how impressed I was that the cadence was so perfect. aaaaand then I watched the video. which was absolutely delicious on SO many levels. I am clearly going to hell, but my favorite part was: "her dog died. WHAT'S THIS?" The first cake is obviously magical Unicorn feces. DUH! LOVE how we got to hear the phone conversation in the middle of the video. That first one looks like a big pile of care bear poo. Freakin awesome! What the heck are people thinking??? Fantastic! More of this please! This is why I freakin' love this blog! You guys are hilarious!! The first cake would have looked perfectly fine saying, "Happy Birthday, Rainbow Brite," if Starlite hadn't left the pile on it. I actually the sheet cake underneath the crap. Whoever was calling will be famous forever. I watched the video at work. BIG MISTAKE! I was controlling my giggles until "Huh...her dog died", I couldn't stop LOL! Now everyone at my office knows I'm not working! One the of best posts ever! [Clap clap clap clap] Brav-O! Encore! Encore! [clap clap clap clap] (insert loud whistle here) BRAV-O! the captions keep getting better and better! "I'm with Jen and John and we're doing this thing... but it's dumb. It's okay..."
Lmao @ "donkey tank surprise"